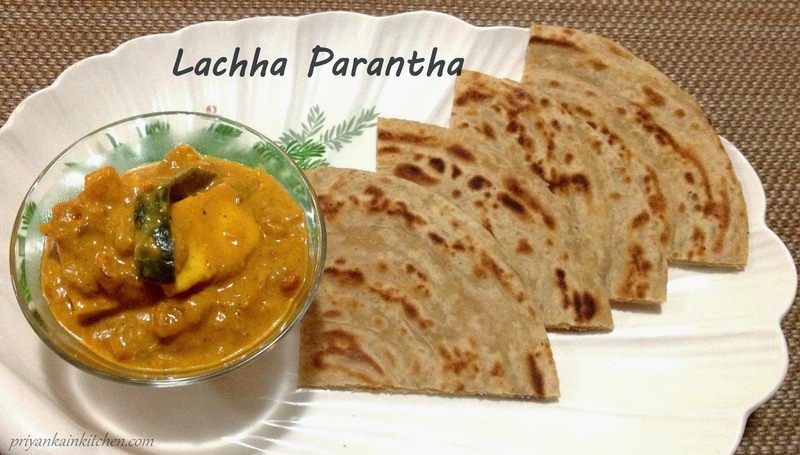 A very frequently ordered bread in Indian restaurants is "Lachha Parantha". Reason being, it goes really well with any kind of gravy. Its crunchiness and taste in itself is so nice that even a pickle or dip with it, does quite well. Though generally it is made with a 1:1 ratio of maida (plain flour) and chapati flour, I prefer to make it only with chapati flour. Once again good in taste, without compromising on health quotient. Method: There are basically two steps, firstly we make rolls of the dough to get the layers and secondly we roll the paranthas out of those rolls and cook them on skillet. Take flour in a bowl, add 1 tbsp of ghee and salt. Knead a soft dough with water. Keep aside for 10-15 mins. Again knead the dough well for 2 mins or until smooth. Make lemon sized balls of dough as shown in pic. Now dust one ball and roll it as thin as you can. Then brush some melted ghee over it as shown in picture. Sprinkle some dry flour covering the whole circle completely. Now start folding it from one side like a hand fan and keep doing it till the other end. Refer the picture. Now turn it 90 degrees and stretch from both sides using your hands. Now start making a roll from one end and finish it through the other end, just like a Swiss roll, as shown in pictures. Now press it with your palm and keep aside. Do similarly with all other dough balls too. Now heat the skillet and take the first roll and roll it into a circular parantha of approximately 1-2 mm thickness. When skillet is hot, put the rolled parantha on it. When bubbles start to appear, flip it over. Now apply 1 tsp of ghee to it and flip again. Again apply ghee as per needed and cook until both sides turn golden and crisp. 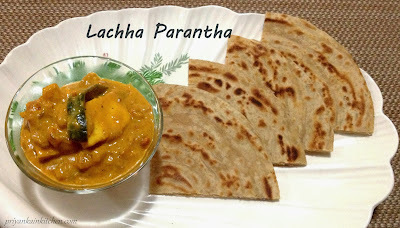 Similarly roll and cook other paranthas. Serve hot with your choice of gravy. Tip: Makings all the rolls in first place has two advantages. Firstly it takes time to make rolls, so doing it simultaneously while cooking is not feasible. Secondly and more importantly, it helps making the layers more distinct.